The National Military Family Association, in partnership with the Bill & Melinda Gates Foundation, hosted an Education Revolution conference September 18 to arm families with the tools to effectively advocate for their child’s education and help educators and policymakers better understand the inequities faced by military families across state lines. Military children move, on average, nine times before they graduate high school, and experience varying standards with each new school. 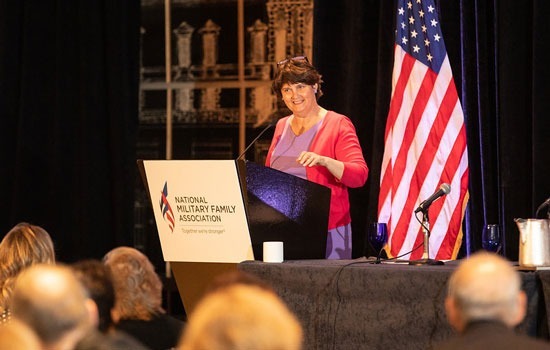 The event welcomed keynote speaker Anne Holton, former Virginia Secretary of Education, and State Senator Scott Surovell of the 36th district in Northern Virginia. Holton, mother of a US Marine and whose father was in the Navy Reserves, assured parents that work is being done within the Department of Education to give military children—and all children—the best possible chance to succeed in the Virginia school system. “We are reexamining how we evaluate school standards and how we hold those schools accountable for meeting those standards,” Holton said. One military parent said she’s concerned states with high education standards, like Virginia, put a focus on teaching to test children, not to help them learn. Surovell, gave parents tips on how to take their education issues to their local representatives. Surovell also encouraged parents to have all their ducks in a row on an issue before they bring it to their local representative—this, along with documentation, notes, and other things—like petitions or other backing—gives representatives, like Surovell, a more well-rounded picture of what’s not working, or what solutions may be needed. During the Education Revolution event, attendees also participated in discussion groups about Special Education, Interstate Compact issues, literacy and math standards, and untapped education resources within the military community. Thank you to our valued education experts for sharing resources, experiences, and time to make this event a success. If you missed the Education Revolution, don’t worry! You can watch the livestream recording and join the conversation on Twitter using #BattleForBetterStandards.